Record HD video in slow-motion and record epic adventures fast, in excellent 1080p resolution at 120 fps. Capture videos more efficiently by controlling the DSP acceleration feature. Gear up for accurate expression of photography thanks to Mavic Air’s fold flush. Enjoy the convenience of smart capture through easy and intuitive hand gestures. DJI’s Mavic Air Fly More Combo comes with high-capacity, lithium batteries that support up to 21 minutes' flight. Besides, you can add extra batteries to extend the flight duration. Thus, you’ll not run out of flight time while exploring your favorite spots. With the complexity of video and photo capture flying over various areas, the drone offers you a SmartCapture camera mode for the quick capture of images by issuing hand gestures. With such a level of control, you have a powerful and smart, flying drone in your hands, and you can take your adventure further by leveraging its active-track feature for tracking up to 16 subjects. Also, you can combine the QuickShot mode and the SmartCapture functionality to capture footage and photos of specific subjects on a specific flight path. With multiple QuickShot modes to choose from, you can capture perfect shots of the subject you wish to track. Besides, it is made for unbeatable portability to give you an excellent user experience. In fact, it has a 3D, foldable design for ultra-portable sizing. You can easily fold it to fit the size of a smartphone. Also, it has a foldable remote controller with a sleek design, which makes it possible hold with your phone for ultimate comfort, with its detachable remote control sticks to guide its flight on the go. 90 Day SpyTec Limited Warranty Products purchased online or from an authorized retailer and under warranty qualify for an exchange with a valid receipt. 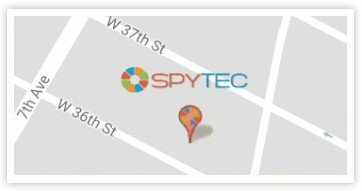 Warranty service is handled entirely by SpyTec.